Use your computer more easily! 1.This laptop computer desk uses environmental technology processed materials and adopts imported particle EPP to reduce the overall weight, making it suitable for the use of ladies or elderly; it is easy to use for people who enjoy lying in bed, or spend much time using computer, won't result in sore legs; it also has powerful cooling effect-you won't feel it too hot on your laps, or feel a sore in your leg because of heavyweight. 2.With the design of handle and the zippered interlayer, you can put your laptop inside casually after finished using it, grab the handle and, you'll be ready to move on to the next workplace; isn't that convenient? 3.The design of anti-slip strip is just more considerate; have you ever worried about the computer's slipping off when using it? 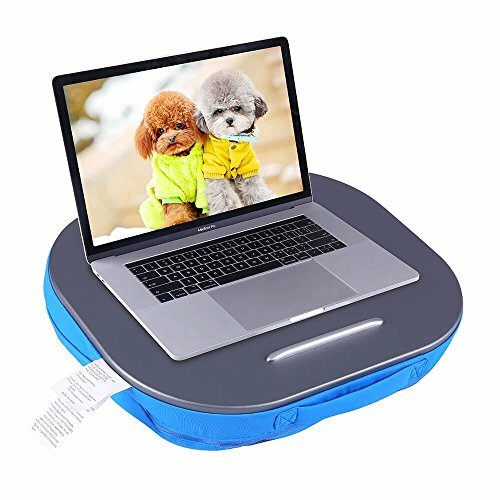 That won't be necessary with our product-this anti-slip strip can totally avoid this problem; with wide and smooth surface, it can well protect your beloved laptop as well! 4.Smooth and good-looking MDF board, very suitable for the use of kids who enjoy painting-a lap desk for kids, and can be easily cleaned, too! Minimum height of the cushion: 2 inches; Maximum height: 3.5 inches; after practical tests, we have designed it to be of the height for the most comfortable use of laptops. Materials:Cover: 85%nylon+15% spandex:Comfortable handfeel, no fuzz ball or fading colors, wear resistant, light fabric, good elasticity, hardwearing; filling：Expanded polypropylene (EPP) features vibration resistance and not distorted easily; lightweight, reduce the weight of objects substantially; environmental friendly materials, naturally degradable; without causing white pollution; MDF board boasts good hardness and bearing capacity, environmentally friendly. Size: 15.7" L*13" W*2"/3.5" H, suitable for computers smaller than 14 inches; Weight: 2.5lb, lightweight, easy and convenient to be placed on your laps and to be picked up. Functions of the lap desk for laptop: Multifunctional, suitable for outdoor or indoor use, inside-car production of handicrafts, reading or writing; also suitable for facilitating the working or eating of people who cannot move conveniently; and for office workers to take a nap on in the afternoon. Design of the optimum angle and height: An angle of inclination of 8 degrees, to keep the height of your sighting line and relieve the pressure and pain at your neck. Cooling Function: EPP material has outstanding heat resistance and thermal insulation, capable of letting heat to diffuse without block to all directions; the articulation passage helps reduce unnecessary heat and provide adequate ventilation. If you have any questions about this product by LIMAM, contact us by completing and submitting the form below. If you are looking for a specif part number, please include it with your message.